Phytoprophen is an herbal based all natural anti-inflammatory that our patients here at Auth Chiropractic and Vitality Center have likely become familiar with. Phytoprophen can be an alternative answer for those seeking a naturally based anti-inflammatory to utilize on a sporadic to regular basis. The botanical extracts in Phytoprofen have been shown to help reduce tenderness, swelling, and bruising after injuries or operations. Other common uses for Phytoprofen include treatment of pain, sprains, strains, inflammation, and even for post exercise relief. The unique properties of Phytoprofen have also been shown to help prevent connective tissue degeneration. This Phytoprofen by Thorne Research, is made with 100% vegetarian plant extracts and is actually hypoallergenic. Thorne Research utilizes a blend of Ayurvedic Herbs that help support the body’s natural response to inflammation. Phytoprofen presents the balancing properties of natural Ginger, Boswellia (Indian Frankincense extract) and Curcumin. Boswellia has been shown to provide relief from occasional aches or soreness, and helps to maintain balanced proportions or our pro-inflammatory chemicals in our muscles, connective tissues such as the tendons and ligaments, as well as within our respritory and digestive tracts. Boswellia extract has positive effects on our Glycosaminogly metabolism, or the way we process certain elements for certain areas in our body. Glycosaminoglycans are important components deep within our connective tissues that compose our joints. Incorporating Boswellia by way of supplementation is show to significantly reduce degradation of glycosaminoglycans, and thereby supports overall joint health and mobility. Phytoprofen also leverages the incredible components of Curcumin, which is extracted from Turmeric Root. Curcumin interacts with our body chemistry as a natural anti-inflammatory! This particular component Mervia, or Curcumin Phytosome, has ready bioavailability for our bodies which means that greater amounts can be absorbed and utilized by our bodies. Phytoprophen also includes Bromelain on the ingredient list. Bromelain is a protein digesting enzyme complex that is derived from pineapple. When taken on an empty stomach, or between meals, Bromelain has been found to help reduce bruising after injuries. Bromelain acts as an enzyme and if taken shortly after eating, will actually help to break down food, as opposed to reducing inflammation elsewhere in the body. With this in mind, Phytoprohen for anti-inflammation purposes is best taken in-between meals for maximum results. All of these unique components combine to create a useful and effective anti-inflammatory that is all natural and safe to use regularly without the risks of dependency or negative side effects. Typical dosages for Phytopropehn are suggested at 2 capsules taken two to three times daily, or as recommended by your health care practitioner. 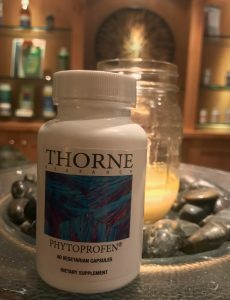 We include Phytoprophen (made available by Thorne Research) along with a few other supplements, in our Initial DRS Protocol Treatment Packages here at Auth Chiropracitc and Vitality Center. We always have Phytoprofen in stock and available for purchase as well. Reach out if you have questions about Phytoprofen or if you are curious as to how this can be included in your daily regiments and routines to help ease your back pain or discomfort.